A portion of the papers of Heinz von Foerster, W. Ross Ashby, Warren S. McCulloch, and Norbert Wiener have been digitized for this pilot project. Aspects of this content can be accessed through the data visualizations on this site. Digital surrogates of the papers as well as machine-extracted metadata about the materials are available through the link below in the University of Illinois Digital Library. 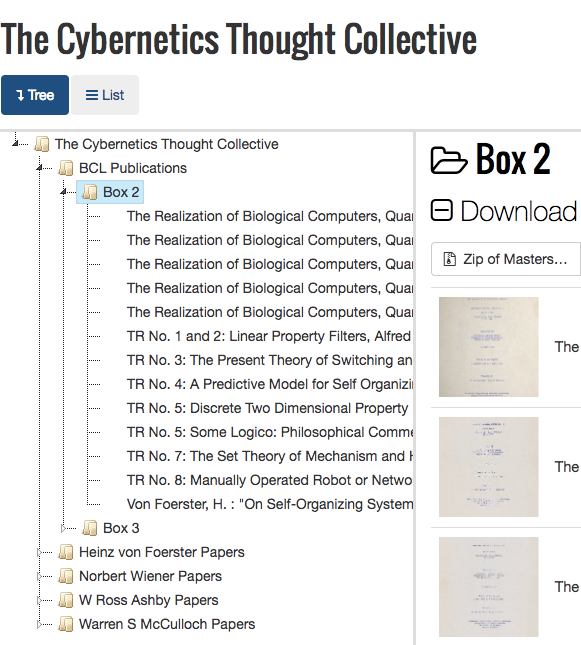 Four kinds of metadata were generated through the named entity recognition, natural language processing, and machine learning tools used on the materials – machine-extracted feature (cybernetic subjects extracted from the texts); associated person (cyberneticians, scientists, and other individuals important to the cybernetics community extracted from the texts); cybernetic classification (broad category into which the machine classified the text); and certainty (likelihood that the text belongs in that category). More information about those tools and code created for the project can be accessed through the project GitHub repository.